The following faculty and former faculty of the MIT SHASS Department of Economics have been awarded the Sveriges Riksbank Prize in Economic Sciences in Memory of Alfred Nobel. 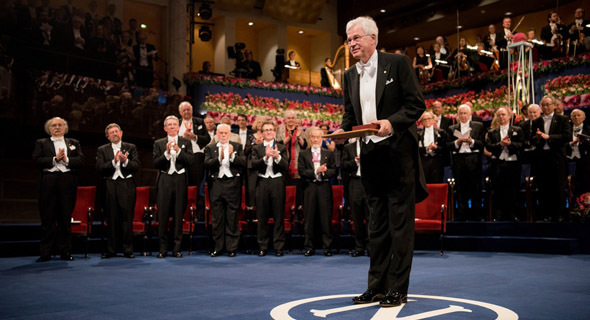 MIT professor Holmström, along with Harvard economist Oliver Hart, was awarded the 2016 Nobel Prize for Economic Sciences in recognition of his work in the field of contract theory. With two other economists, Professor emeritus Peter Diamond was awarded the Nobel Prize for Economic Sciences in recognition of his analysis of markets with search frictions. Paul Krugman, MIT Economics PhD and former faculty member, was awarded the 2008 Nobel Prize for Economic Sciences in recognition of his analysis of trade patterns and location of economic activity. Institute Professor emeritus Robert Solow was awarded the Nobel Prize for Economic Sciences in recognition of his contributions to the theory of economic growth. Professor Franco Modigliani (1918–2003) was awarded the Nobel Prize in Economic Sciences for his pioneering analyses of savings and financial markets. Professor Paul Samuelson (1915–2009) was awarded the Nobel Prize for Economic Sciences in recognition of the work through which he developed static and dynamic economic theory and contributed to raising the level of analysis in economic science. In addition to faculty and former faculty, alumni of the Department of Economics who have received the Sveriges Riksbank Prize in Economic Sciences in Memory of Alfred Nobel include Robert J. Schiller (2013). For a list of MIT Nobel laureates in all fields visit the Institutional Research website.